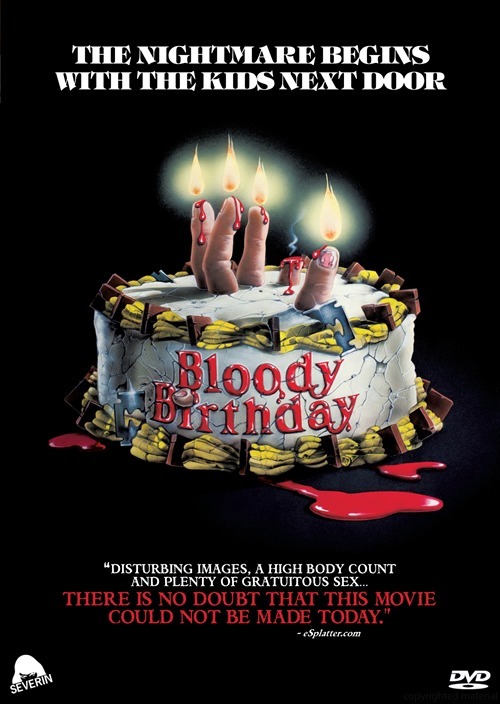 Digi-Schlock: BLOODY BIRTHDAY (Severin Films DVD & Blu-Ray) – Schlockmania! 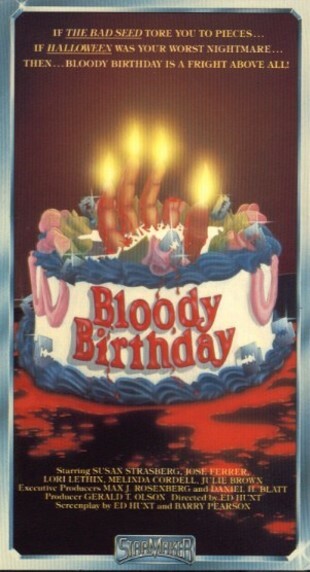 Schlockmania completes its look at Severin’s trilogy of June horror film releases with this review of Bloody Birthday. Like The Baby, this one has been on DVD before – via an anamorphic transfer from VCI with a mediocre look to it. Thankfully, Severin’s release offers a genuine improvement in image quality and throws in a few bonus features to sweeten the deal. Severin’s disc of Bloody Birthday offers a crisp anamorphic 1.78:1 transfer taken from a new HD master. As a result, it offers a real boost in clarity and color from previous versions and does a great job of showing off how good Steven Posey’s photography is for such a low budget film. The soundtrack is presented in its original mono mix and the blend of dialogue, effects and music works well. There are also a few extras thrown in. The first is a brief interview with star Lori Lethin, done by documentarian Elijah Drenner. It’s a punchy little piece in which Lethin discusses her career and the shoot of Bloody Birthday in a breezy, cheerful style. Topics covered include her memories of director Ed Hunt, her young costars and how there wasn’t a lot of “child safety” concerns on this distinctly low-budget set. Next up is a lengthier audio interview with Ed Hunt. Any questions were removed so it basically takes the form of a 50-minute lecture in which Hunt discusses his entire career. 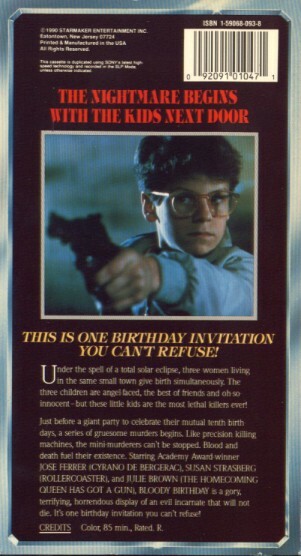 Bloody Birthday is briefly discussed a few times but more focus is placed on Hunt’s oddball sci-fi films like Starship Invasions and The Brain. Hunt can get a little dry at times but he covers some interesting material, including his own personal survey of the horror genre and what its classics are. If you ever wondered who Ed Hunt is and how he ended up making all those weird films, this will shed a little light on the topic. The packag e is rounded out by A Brief History of Slasher Films, also included on Severin’s Nightmares DVD (notes on this featurette by checking out that review) and a short collection of trailers for other horror fare from Severin. 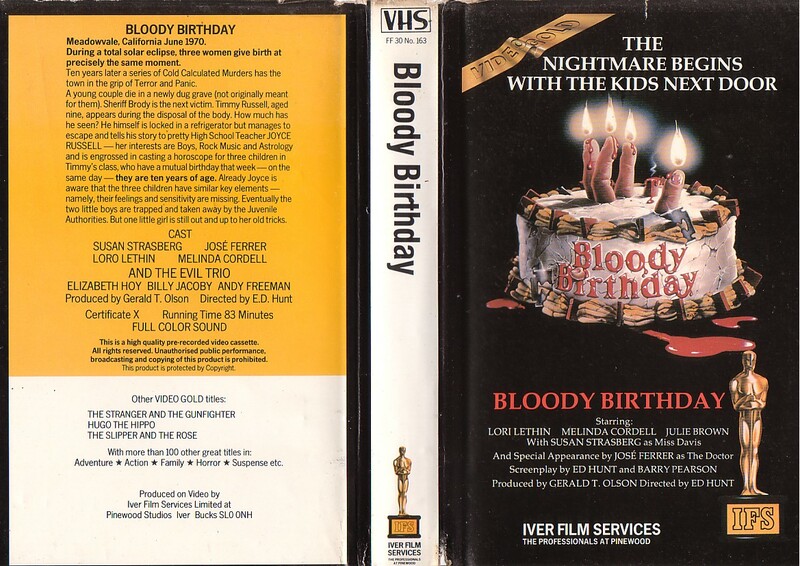 It’s mildly disappointing that there is no trailer for Bloody Birthday itself but what’s here offers a nice little bonus-material boost to this title. In short, this is the best way to see Bloody Birthday. Slasher fans shouldn’t hesitate to pick it up. Blu-Ray Update, 7/2014: Severin has revisited this title, along with The Baby and Bloody Moon, for a blu-ray release that made its retail debut on July 8th, 2014. The HD transfer looks good, faithful to the film’s low-budget celluloid appearance while enhancing it with new levels of color and crisp detail. The DTS mono track also sounds pretty smooth for a vintage production. The extras from the Severin DVD are carried over and there are also a few easter eggs that horror fans will have fun with. This upgrade is recommended for high-def horror buffs.